When today's Hudson Valley growers are lionized in the pages of foodie magazines or the travel section of the New York Times, they are depicted as practicing a dying trade and preserving open space for the cultural and environmental good. Many of the region's farmers see themselves as part of a hardscrabble agricultural tradition (my own hometown in the region celebrates an annual "Hardscrabble Day"), and certainly their precarious economic position relative to owners of factory farms supports this perspective. Many of their ancestors came from very humble backgrounds, and some struggled against the oppressive tenant system of the eighteenth and nineteenth centuries. Though they may own hundreds of acres of land and hundreds of thousands of dollars' worth of farm equipment, their ability to stay afloat from year to year is never assured. Yet advocates of open space preservation see farmers' valiant fight to "hold on" as a defense against the developer's bulldozer. In the blizzard of attention around the virtues of local food production, food writers and activists place environmental protection, animal welfare, and saving small farms at the forefront of their attention. Yet amid this turn to wholesome and responsible food choices, the lives and working conditions of farmworkers are often an afterthought. Labor and the Locavore focuses on one of the most vibrant local food economies in the country, the Hudson Valley that supplies New York restaurants and farmers markets. Based on more than a decade’s in-depth interviews with workers, farmers, and others, Gray’s examination clearly shows how the currency of agrarian values serves to mask the labor concerns of an already hidden workforce. She also explores the historical roots of farmworkers’ predicaments and examines the ethnic shift from Black to Latino workers. 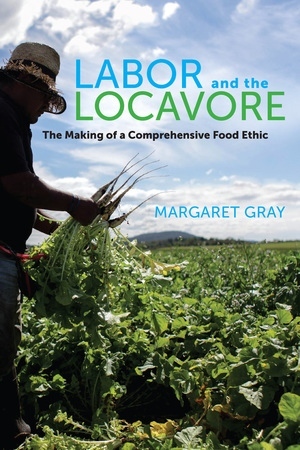 With an analysis that can be applied to local food concerns around the country, this book challenges the reader to consider how the mentality of the alternative food movements implies a comprehensive food ethic that addresses workers’ concerns. Margaret Gray is Associate Professor of Political Science at Adelphi University. Introduction: Is Local Food an Ethical Alternative?